- RN Case Manager/Educ. Coor. (this is the LAST July Release Party- because we move to an Annual publication in January). This is a great netwroking event with 300+ attending. Feel free to invite your colleagues and referral sources. Sponsors should receive a full box delivered to your office this week. Over the next 2 weeks we will complete deliveries to EVERY hospital, senior center, Area Agency on Aging, library, meals on wheels site, and hundreds more locations. Please email us if you would like to receive more guides for your use. 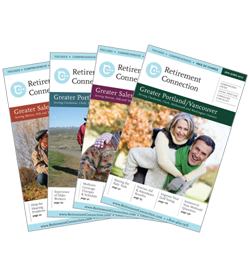 Regular July meeting has been cancelled, so members can attend the Retirement Connection Release Party. BUNCO Fund Raiser for MPH "Patient Assistance Fund"
We forget that we have a choice in how we respond to an event? We can choose to be angry, let something just roll off our backs, or choose to focus on a positive. The anger keeps us from moving on, and we are not paying attention when the good stuff happens. We have a choice- which did you make?